OTTAWA (Reuters) - A major bloc of Latin American nations and Canada will discuss on Monday how to maintain pressure on Venezuelan President Nicolas Maduro to hold new elections as he faces widespread calls to resign after last year's disputed presidential vote. Most group members say Maduro should quit in favor of opposition leader Juan Guaido - who declared himself interim president last month - and are calling for a new presidential election in the troubled OPEC nation. "How can we continue to support the opposition to keep the pressure up on the regime and push for new elections? Certainly that's something we'll be looking at," said a Canadian government official. 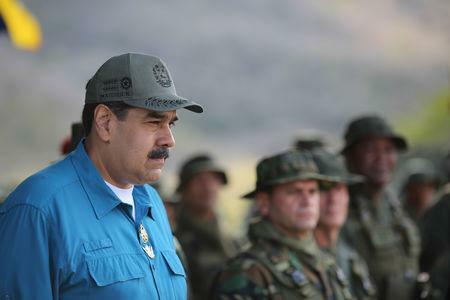 Maduro, who has overseen an economic collapse and the exodus of millions of Venezuelans, said in an interview that aired on Spanish television channel Antena 3 on Sunday: "We don't accept ultimatums from anyone," adding: "I refuse to call for elections now - there will be elections in 2024." Monday's meeting in Ottawa will also discuss how to aid the people of Venezuela, including through immediate humanitarian assistance, said the office of Canadian Prime Minister Justin Trudeau. U.S. President Donald Trump's administration last week issued sanctions on Venezuelan state-owned oil firm PDVSA in a move likely to cut revenues for a country hit by medicine shortages and malnutrition. Trump, in an interview that aired on Sunday, said military intervention in Venezuela was "an option." Trudeau spoke on Sunday to Guaido and the two "discussed the importance of the international community sending a clear message regarding the illegitimacy of the Maduro regime," Trudeau's office said. "The most important issue now is to get Europe in line and to deepen the isolation of Venezuela and its backers," said a government official in Bogota, who spoke on condition of anonymity.